I had originally wanted to make a fun rhubarb cocktail for this post, but since I have a half marathon coming up this weekend I needed all the hydration I could get! And aren’t mocktails the new cocktails anyway…? 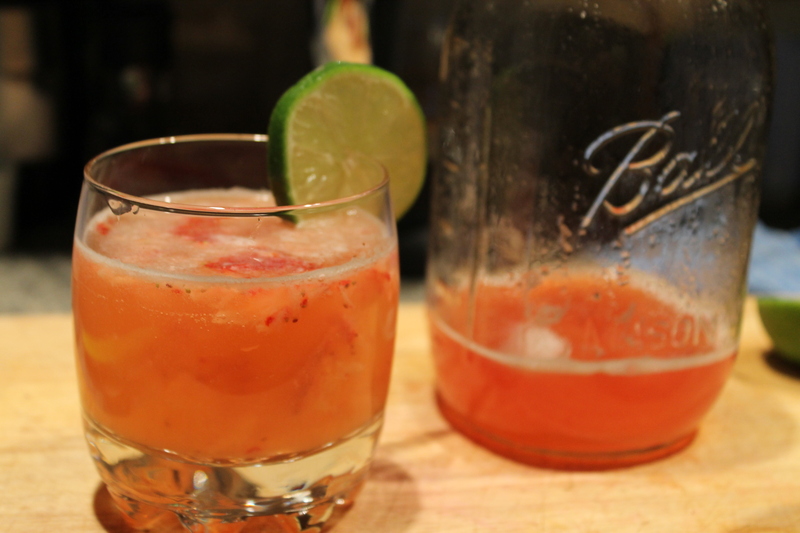 So here is a delightful rhubarb agua fresca with muddled strawberry & a splash of lime. Early summer in a glass! Smash the strawberry in the bottom of your glass with a muddler or a spoon, add the lime juice and rhubarb simple syrup and top off with some seltzer. Done! To make the rhubarb simple syrup combine 1 large stalk of rhubarb, sliced into 1/2 inch slices (about 1 cup), 1 cup sugar, and 1 1/2 cups water in a small saucepan. Bring the mixture to a boil, then simmer over medium heat until the rhubarb is falling apart. Strain the mixture through a fine sieve, cool, and store in an airtight container in the refrigerator! This entry was posted in Citrus, Cocktails and Mocktails, Rhubarb and tagged agua fresca, drink, lime, mocktail, rhubarb, simple syrup, strawberry, summer. Bookmark the permalink.